Available with either &frac58;" or ½" tubing. Scroll down the page for ½" packages. Radiant heating is the most clean and energy-efficient way to heat your shop or warehouse and RHT Pole Building Packages have everything you need for a DIY project. 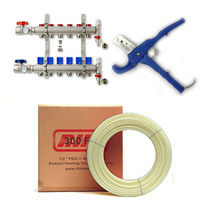 All packages come with USA PEX. USA PEX is functionally the same as PEX B, but its manufacturing process is more environmentally friendly and it is made in America.